If you would like to do the repair yourself, we have created two instructional videos to guide you through the disassembly process (also called a teardown) here: Teardown Video Screen Replacement Video The process for the C55D and C55DT are pretty much the same so use the C55DT video. The replacement service that we provide for the Toshiba Satellite C55T includes the cost of a brand new LCD screen and the labor to install it. This service also comes with a No Dead Pixel Guarantee and a 6-month warranty on parts and service. We use genuine new LCDs, not aftermarket or cloned products. The Digitizer and the LCD screen are the same as for the C55DT. 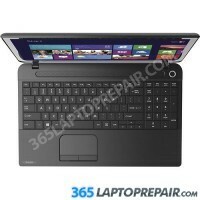 The Toshiba Satellite C55T AMD comes standard with 4GB memory. You can upgrade to 8GB, 12GB or 16 GB.